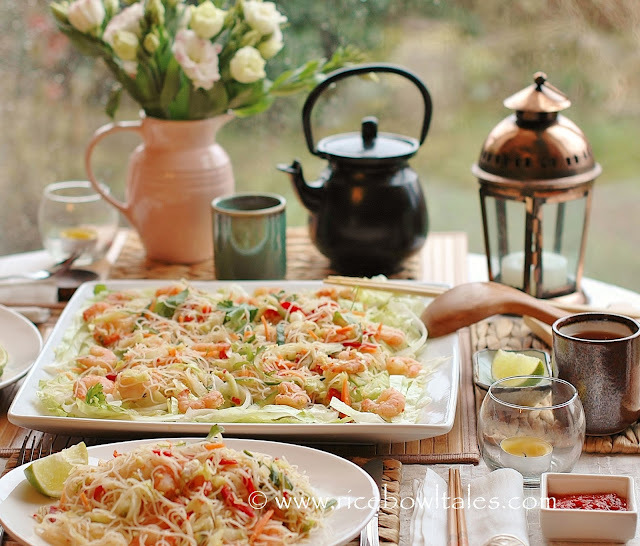 In one of my previous posts " Chicken and sesame noodle salad ", I talked about eating cold noodles in hot summer days; how many different types of cold noodle dishes there are, how convenient they can be and how delicious they all are. 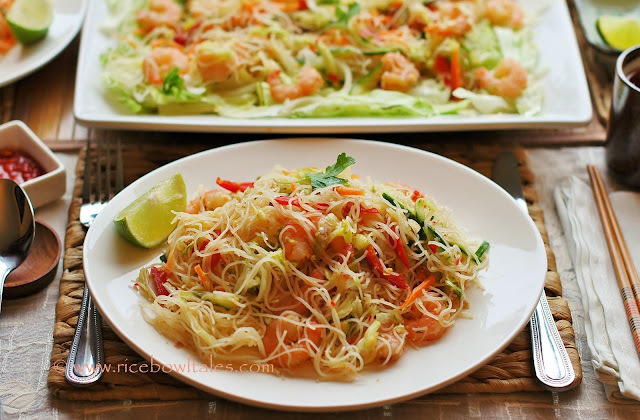 So this time, I would like to share with you how to make this " Chilli king prawn and vermicelli salad ". It's also a cold noodle dish, but for this recipe I've used vermicelli instead. Vermicelli and I have got such a long and sentimental connection. My mum used to cook it for us for breakfast quite often when we were little. A small bowl of fine white noodles in a broth; with some fried spring onions scrambled eggs, and a few slices of seared pork sausages on top. Although I was not keen on eating anything in the morning, but whenever my mum made this, I would be happy to have some before I went to school. Making a cold vermicelli salad is much simpler. All you have to do is soak the fine noodles in boiling water for 5 - 10 minutes, refresh under cold water and drain. Then just add the cooked seafood or meat, salad; stir in the dressing, mix well together and serve. 24 - 32 medium size king prawn ( 6 - 8 per person ), shelled, deveined and cooked. Put the dressing ingredients A in a processor to blend into small pieces, tip it in a bowl with dressing ingredients B; stir well to make the salad dressing. Place half of the shredded lettuce on a big deep plate, put the remaining half of the lettuce in with the cucumber; carrots; red peppers and mint leaves together to make the salad. Dip each of the king prawns in the salad dressing to coat then leave to one side. add the rice vermicelli in the salad, pour in the salad dressing to mix well together. 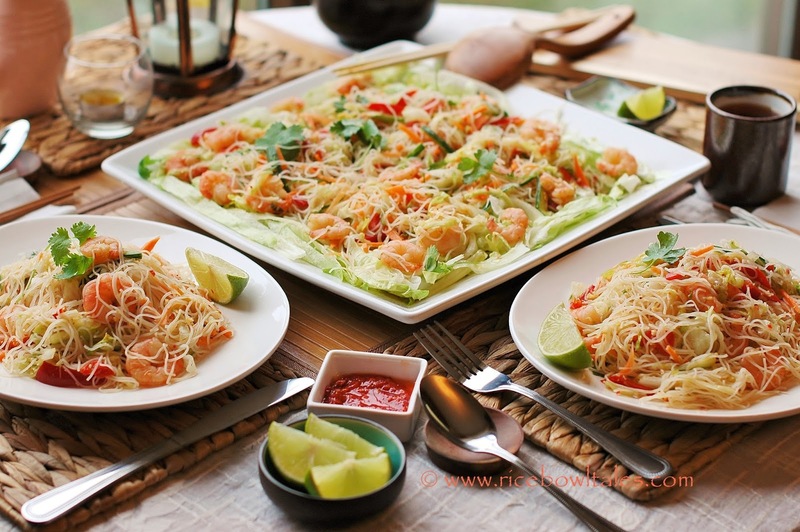 Use a tong to lift the vermicelli salad onto the lettuce in the big plate; arrange the king prawns on top of the salad, garnish with coriander and serve. In a grey and rainy summer day. 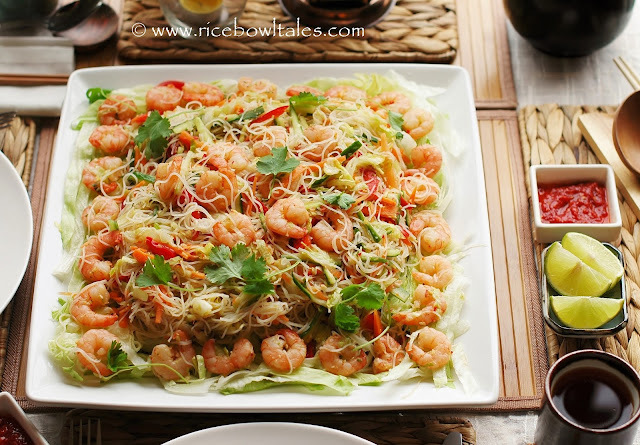 A plate of this light and crunchy chilli king prawn and rice vermicelli salad; not only will it revitalize your dulled taste buds, it will helped to lift up our dampened spirits too. a lot of prawns, love it! I like cold noodles too. Very refreshing. My mum also used to cook rice vermicelli a lot. That's true, I think nothing beats a plate of cold noodle in summer days. 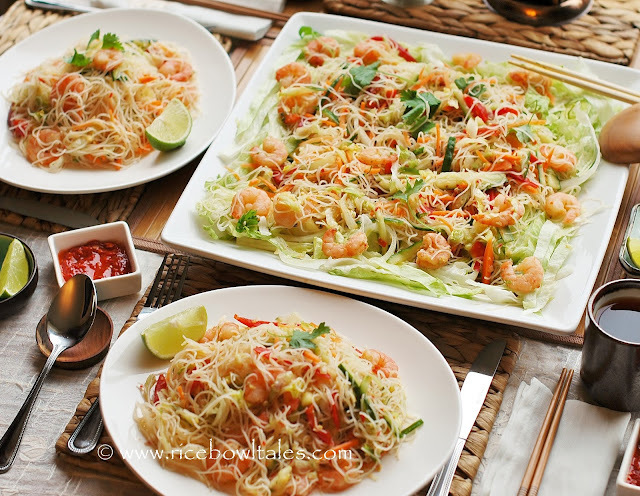 Very attractive and refreshing prawn and Rice Vermicelli Salad! YUMMY ! Thank you! I love rice vermicelli, it's so easy and versatile, one of the best dry noodles to create mouth watering dishes with. Another wonderfully simple but tasty salad :) How long will it last in the fridge because I think making a batch and taking it to work for a few days will be great!